Leader of Robert Mugabe's guerilla forces before independence in 1980. Appointed by Mugabe afterward to Chief of the Army. 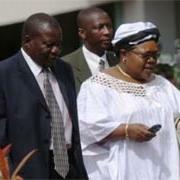 Seen here with his wife, Vice-President Joice Mujuru. Known to his fellow guerillas by the wartime pseudonym Rex Nhongo, Solomon Mujuru served as the Commander of the Zimbabwe African National Union (ZANU), a liberation army. ZANU was under the leadership of Robert Mugabe with bases in neighboring Mozambique. In 1978, just before Independence, Mujuru had crushed an attempt to overthrow Mugabe, a move which tightly linked the two men well into the first few years of Zimbabwe's autonomy. When the guerillas won Independence in 1980 and changed the British colonial name of the country from Rhodesia to Zimbabwe, Mugabe made Mujuru head of the army. Mr. Mujuru quit the position in 1990 on a business trajectory. He is suspected of owning somewhere between 6 and 16 farms, including properties taken during the "landgrab" from white farmers. He also put in a bid for the multi-billion dollar chrome mining company, Zimasco. Although he is officially removed from political office, Mujuru maintains his party affiliation and close ties to ZANU-PF. Internationally, personal sanctions have been imposed by the U.S. against Mujuru and his wife, Joice and within Zimbabwe, he is regarded as one of the most feared men in the country. Mujuru died on the night of August 15 at his Beatrice farm in Harare South, where he is reported to have been burnt to death.